The call for this week: Nassim Taleb (trader extraordinaire) has 10 rules. Rule number 8 reads: “No matter how confident, always protect the downside.” We agree and therefore always try to “look” down before looking up in an attempt to manage the risk. As for the “here and now,” the broadest index them of all, the Wilshire 5000, has strung together 11 consecutive higher sessions, a feat not seen since the mid-1990s. Accordingly, it is pretty over-bought on a short-term basis. 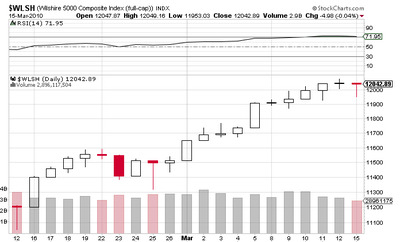 That upside skein can be seen in the candlestick charts, which have not experienced a downside “red candlestick” session since the upside reversal of February 25, 2010. We are therefore turning cautious, but not bearish, on a trading basis. That strategy suggests a short-term correction is potentially due, but NOT an intermediate-term bearish decline. 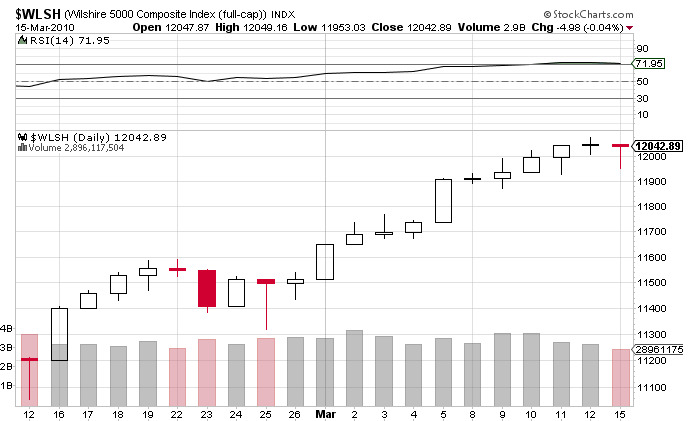 Indeed, since the end of the envisioned January/ February “selling stampede,” we have been constructive on stocks. However, we currently think pairing some trading positions, and/or raising stop-loss points, is warranted. Meanwhile, a number of our Japanese recommendations broke-out to the upside in the charts last week, the Reuters/Jefferies CRB Index (commodities) broke below its rising trendline, the 10-Year Treasury Yield Index (TNX/3.71) broke above its 50-day moving average (read: higher rates), the Volatility Index (VIX/17.58) continued to trade below 18 (read: too much complacency), mutual fund cash positions are at historic lows of 3.6%, and the NYSE overbought/oversold indicator tagged a rare overbought reading above 90 last week. Ergo, colour us cautious in the very short-term..